The Edaran Classic 2008 held at the Terengganu International Endurance Park, the venue of the forthcoming World Endurance Championship 2008 in Terengganu, ended today with 8 successful completions out of 18 starters in the CEI 3* 160km ride category and 6 horse and rider teams earning their Certificate of Capability (COC). On June 27, participants attended an information and knowlege-packed seminar on endurance riding organized in conjunction with the Classic. 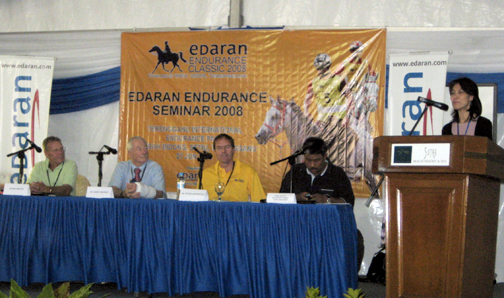 Speakers at the half-day seminar which was also held at the Terenggau International Endurance Park, included reputed equine exercise physiologist, Dr. Kerry Ridgeway from the USA, equine nutritionist and veterinarian Dr. Peter Huntington from Australia and master farrier Mr. Kevin Crafar from New Zealand. Five riders from Malaysia were among the top 160km finishers this weekend at the Cazon Endurance Village in Argentina. First place finisher was Argentina's Mercedes Tapia riding Caiparinha, a bay Polo horse that began her second career as an Endurance horse at Tapia's El Reparo Endurance training center 3 years ago. Tapia is one of Argentina's top riders, and this was Caiparinha's first win over a 160km course. Caiparinha also received the Best Condition award. DUBAI - His Highness Shaikh Mohammed bin Rashid Al Maktoum, Vice-President and Prime Minister of the UAE and Ruler of Dubai, led the UAE riders to their first seasonal European endurance title in Britain. The race comes as part of the preparations of the national team for the World Championship scheduled to be held in Malaysia during the month of November. Riders from France, Britain, Australia and the UAE took part in the competition which extended over 120 kilometres in relatively favourable weather conditions. The three-member squad joined hands before they crossed the finish line ahead of the others. Shaikh Rashid Dalmook bin Jumaa Al Maktoum and Abdullah Saeed were the other two members of the winning team. According to the race reports, Shaikh Mohammed showed the way right from the start, followed by Shaikh Rashid Dalmook in the first 36km loop which they covered in 1:55:11 seconds at an average speed of 19,07/hr. Shaikh Mohammed continued to set the pace in the second and third stages before the UAE riders dominated the field and went clear to cross the finish line in 3:31:28 seconds. Sultan bin Sulayem was crowned champion of the 160km endurance ride which was held in the same venue. Shaikh Majid bin Mohammed who started as hot favourite to win the ride, pulled out after the third loop to protect his horse. The UAE rider and trainer Mubarak bin Shafiya said they were quite satisfied with the strong performance of the UAE riders. Saeed Al Tayer, vice-chairman of the Dubai Equestrian Club said it was great to see the UAE riders winning two races at the same time in one day. "UAE riders are the true champions of the world," he said. BAHRAIN'S Royal Endurance Team captain Shaikh Nasser bin Hamad Al Khalifa and Ahmed Abdulsamad clinched victories in the Austrian International Endurance Horseride held yesterday in Bad Blumau, Austria. Shaikh Nasser, the Bahrain Royal Equestrian and Endurance Federation president (Breef), took the 160km race by clocking the best time of nine hours, 59 minutes and 22 seconds with a record speed average of 19.91 kms per hour. The Bahraini riders dominated this race, winning the next two positions through Ahmed Abdulla (9:59:25) who came second, followed by Ghazi Al Dossary (9:59:26) in third place. Could Australia's wild horses be about to take the endurance world by storm? Thirteen wild horses from Western Australia have been plucked from the wilderness, and, in a tale reminiscent of "My Fair Lady", now find themselves living in air-conditioned comfort in Dubai with personal grooms. Their mission is to make their mark in the sport of endurance in what will be an interesting tussle between the survival-of-the-fittest law of natural selection and the selective breeding of horse owners. The whole exercise had its roots in a website built by Broome woman Libby Lovegrove to alert the world to the plight of horses in the broad expanses of the Kimberley. THE FEI WORLD ENDURANCE CHAMPIONSHIP 2008 LAUNCHED WITH A BANG! June 21, Kuala Lumpur: The FEI World Endurance Championship 2008 (FEI WEC 2008) was officially launched at Dataran Merdeka. The launch started off with a parade of 48 horses and riders from the Kuala Lumpur City Hall and the Royal Malaysian Police mounted units accompanied by police outriders, 2 marching bands, from the Malaysian Prison Department and the Kuala Lumpur City Hall along with a convoy of 10 cars and 15 motorbikes from Sime Darby Motor; the official vehicle partner for the FEI WEC 2008. The parade began from Lake Titiwangsa to Dataran Merdeka, along Jalan Tuanku Abdul Rahman. The Official Launch in Dataran Merdeka began upon the arrival of Seri Paduka Baginda Yang di-Pertuan Agong and Seri Paduka Baginda Raja Permaisuri Agong (The King and Queen of Malaysia) and it started off with a colourful performance from the Kuala Lumpur City Hall Cultural Group. Emmett B. Ross has been selected as the Endurance Discipline Manager for the 2010 Alltech FEI World Equestrian Games. Ross brings more than 20 years of international endurance riding experience, acting as trainer, Chef d'Equipe, manager, participant, organizer, and consultant in more than 100 FEI 2 to 4* endurance events in more than 14 countries. "I am honored and delighted to take on the role of endurance discipline manager, and look forward to working with the team of disciplines managers to help create a world-class competition environment and endurance course for the upcoming 2010 Games," Ross said. Ross is one of eight discipline managers responsible for planning, managing and directing the world championship competitions in eight equestrian sports. As an athlete, Ross was a Gold medal team member in the first North American Championships, and a three-time, top-10 finisher in the Tevis Cup in Auburn, California. Ross is the only trainer and coach in the world with FEI endurance wins in nine different countries. BAHRAIN's Royal Endurance Team arrived yesterday in Graz City in Austria as they prepare to make debut in Austria's International Endurance Horseride scheduled for Saturday in Bad Blumau. The team, to be led by Bahrain Royal Equestrian and Endurance Federation president Shaikh Nasser bin Hamad Al Khalifa, will be among 120 riders from 12 European countries taking part in races over 120km and 160km, both on Saturday. After a long journey via Frankfurt Airport, the 25-member delegation reached the Austrian city without Shaikh Nasser who is due to arrive tomorrow to join the team training prior to the championship. Commenting on his team's participation, Shaikh Nasser said they recently decided to take part in this race which replaced Thatford Race in the UK due to similar weather conditions in Austria and Malaysia, which will host the World Championship from November 9 to 11. The Bahrainis are seeking to have as many riders qualified as possible for the World Championship to be held at Terengganu International Endurance Park in Setiu Terengganu. Shaikh Nasser added that this will be the first time for the team to participate in a race in Austria, having mostly competed in the UK and France, besides Ireland, Germany and Portugal. Team manager Dr Khalid Ahmed Hassan said the team is confident of doing well in the race, stressing on the importance of finishing the event without being disqualified in their bid to reach the World Championship. Three horse and rider combinations have been named to New Zealand's team to compete in the 2008 World Endurance Championships in Malaysia in September. Jenny Champion and Freckles, Philip Graham and Wolfgang Amadeus, and Andrea Smith and Sierra Nevada have been selected. photo: Colourful handover: The King receiving the International Equestrian Federation (FEI) flag from Ian Williams, FEI director of non-Olympic sport. KUALA LUMPUR: Yang di-Pertuan Agong Tuanku Mizan Zainal Abidin launched the International Equestrian Federation (FEI) World Endurance Championship 2008 at Dataran Merdeka on Saturday. Earlier, 41 horsemen paraded through the city via Taman Tasik Titiwangsa, Jalan Pahang, Jalan Tuanku Abdul Rahman and Jalan Raja before marching past the King at Dataran Merdeka. The championship, which will be organised by Yayasan DiRaja Sultan Mizan (YDSM), would be held at Lembah Bidong in Terengganu from Nov 6 to 9. Besides the 41 horsemen, each holding the flags of participating nations, there was a spectacular parachuting display by four paratroopers from the Royal Malaysian Air Force. They carried the Jalur Gemilang, the flag of Terengganu, FEI and YDSM. The FEI flag was handed over by its director of non-Olympic Sport Ian Williams to the King who then passed the colours to YDSM to declare the championship formally sanctioned to be held in Terengganu. In his speech World Endurance Championship chief executive officer Datuk Dr Salleh Mohd Nor said about 140 endurance riders from all around the world were expected to take part in the event. Entries from 41 countries have been confirmed. 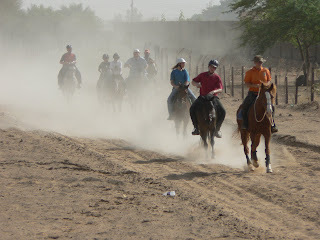 On the 9th May, KICS Riding Club held the first ever endurance ride in Sudan. Of course we had big plans to hold it out on a farm about 80kms out of Khartoum, but unfortunately due to last minute problems we had to hold it in and around Soba. We managed to change the plans at the last minute and still have a succesful weekend. JOCKEY Rachel Dewar, 79, came second in an epic 78-mile race and put it down to being young at heart. The grandmother-of-two, who was in the saddle for 12 hours, modestly played down the fuss. She said: "All you've got to do is sit there, it's not that hard." Rachel, of Duns, Berwickshire, started the circular Hillhead Endurance Race at 7am in Musselburgh, East Lothian. She finished on her horse Gypsy Cream at 7pm and admiited: "I was certainly feeling it for a few days afterwards." Rachel, who took up endurance riding when fox hunting was banned, said: "I've got plenty of life in me yet. Horse riding keeps me fit." PETALING JAYA: Five Malaysian riders have qualified thus far for the FEI World Endurance Championships (WEC), which will be held at the newly-built Terengganu International Endurance Park (TIEP) in Lembah Bidong from Nov 6-9. The Malaysian challenge will be spearheaded by the Yang di-Pertuan Agong, Tuanku Mizan Zainal Abidin. The WEC chief executive officer, Datuk Seri Dr Salleh Mohd Nor, said that the others who have secured qualification were Datuk Kamaruddin Abdul Ghani, Rosdan Mohd Nor, Mohd Shuaib Ishak and Abdul Halim Alihan. As hosts, Malaysia have been allotted 12 places in the championships and have until Aug 21 to complete their qualification quota. "I am very confident that our riders will be able to fill up the remaining seven places," said Dr Salleh at a press conference yesterday to announce the details of the championships. "The entire training and selection process of the riders for the WEC have been left to the National Sports Institute (NSI)." The NSI director general, Datuk Dr Ramlan Aziz, said that there were several qualifying events more for riders to make the cut. "There is a group of 11 riders and they are very serious in their training and have been pushing hard," he said. The Terengganu International Endurance Park (TIEP), the venue for the World Endurance Championship 2008, is rated as one of the best in the world by the International Equestrian Federation (FEI). The endorsement came from non other than FEI’s Non-Olympic Sports Director Ian Williams who has been regularly inspecting the TIEP situated in Lembah Bidong, Merang in Setiu, near Kuala Terengganu. "I have been to many other venues around the world and the TIEP a number of times. The facilities there are simply fabulous and most impressive. I must say this is among the top three in the world, with the other two in the middle east," said Williams at the launch of the event here today. “The stables are luxuriously spaced out, the crewing area, the departure gates and the permanent vet gates with more than 20 trotting lanes puts TEIP among the elite group of endurance venues," he said. Terengganu will host the WEC, the first tropical country to do so, from Nov 6-9 at the TIEP with about 140 riders from 41 countries competing in the individual and team events held over 160km. The Malaysian challenge will be spearheaded by the country’s number one sportsman, Yang di-Pertuan Agong Tuanku Mizan Zainal Abdidin, who became the first Malaysian to qualify for the WEC. AN oil sheik billionaire has started flying wild mares and stallions from remote WA to Dubai to create a "super breed of endurance racehorse. Thirteen of the animals have arrived at plush stables in the United Arab Emirates from Lake Gregory, south of Halls Creek in the Kimberley, Peth Now reports. The deputy ruler of Dubai, Hamdan bin Rashid Al Maktoum, sent his personal Australian veterinarian Alan Post to hand-pick them for breeding and racing. He was alerted to their plight by a website run by Broome woman Libby Lovegrove. Mr Post said the horses, previously regarded as pests and sold for pet food at $20 a head, could spark a stampede of orders from other cashed-up Gulf stables if they did well. "The boss hasn't seen this lot yet (from Australia) because he's away, but if he likes them he will send us back for more,'' Mr Post told The Sunday Times from Dubai. They will initially be used for the popular sport of endurance racing, covering distances of between 120km to 160km. "They are thoroughbred types with a dash of Arab with good strong hearts, something which is probably genetic and passed on from original bloodlines,'' Mr Post said. He said the sport was "massive'' in Dubai because sheiks could compete. "They don't have to be expert riders or be the weights of jockeys,'' he said. The tycoon owns thousands of horses and spends much of his time in England for big-ticket racing events. Ms Lovegrove, an ardent animal rights campaigner, said it was a potential breakthrough after three years of hard work. "This is wonderful news that could guarantee the future of the horses and provide a form of revenue for the three Aboriginal communities around Lake Gregory,'' she said. Ms Lovegrove started her website after visiting the area with Margaret River equine veterinarian Sheila Greenwell. Her research has indicated that many of the horses are descendants of thoroughbred Arab horses, taken to the Balgo and Kalumburu missions by priests looking to breed and sell them in the 1930s. Some were used as stock horses on cattle stations, but were released into the wild when replaced by motorcycles and helicopters. "Today, these beautiful horses (palominos, buckskins, chestnuts and paints) roam the wild gorges, rainforests and parklands of the northern Kimberley,'' Ms Lovegrove said. The Paruku (Lake Gregory) indigenous protected area is a wetland of national and international importance, covering about 270,000ha in the northern Great Sandy Desert. ASSISI – Finally kissed by weather conditions less penalizing compared to the previuos days, the Italian Championships of equestrian endurance in Assisi have concluded. The tricolour verdicts expressed in the day of Saturday have been completed by a very heartfelt appointment like the Pony Endurance competitions reserved to the youngest people. The daughter of art Costanza Laliscia, who saddling Flamenco has excelled over the shorter distance, and Alessandra Lolli, who has laid down the law on the longer competition, have placed side by side Simona Garatti and Enrico Ercoli, respectively Absolute Italian Champion and Young riders Italian Champion at the end of the two competitions played on Saturday. The curtain, which is fallen on the Absolute Championships, has also been the occasion to strike a first balance, that is certaintly good by the light of the logistic difficulties caused by the bad weather conditions. The torrential rains fallen down for the whole week and above all on Friday and Saturday - during the competitions as well- have put to hard test the organizational machine created by Umbria Endurance Equestrian Team. The reply, however, has been as proud and furious as the climatic "provocations": the route of competition, in every respect under examination by the International Equestrian Federation considering the next European Championships, has brilliantly passed the test, proving to be technically high-level and extremely resistant for what concerns the consistence of the ground as well. The rest has been made by the passion, the preparation and the spirit of sacrifice with which the staff and the lot of volunteers have undertaken in order to guarantee all the competitors the best conditions to express the maximum level. Not by chance the endurance responsible of the Fei, Ian Williams, has had words of great appreciation: "I can but express a positive judgment about the route of these Italian Championships, that are going to be the theatre of the European Championships in 2009: it´s a perfect mix by the point of view of the altimetries and it really succeeds in getting the talents of the best horses emerged. We are waiting with great interest for coming back to Assisi on occasion of the next year competitions". 1. Simona Garatti-Z’Tadore Al Maury; 2. Danilo De Angelis-Present Jey; 3. Gianluca Laliscia-Seerseri. 1. Enrico Ercoli-Schhadja; 2. Marco Sardo-Dellaru; 3. Giordano Bottiglia-Zefirio. 1. Simona Garatti-Z’Tadore Al Maury; 2. Danilo De Angelis-Present Jey; 3. Jack Begaud-Magui de la Perriere. 1. Costanza Laliscia-Flamenco; 2. Maria Chiara Fischetto-Farfallina; 3. Martina Fabrizi-Dotto. 1. Alessandra Lolli-Alish Kashmir; 2. Francesco Ricci-Golden Died; Maria Sara Santicchia-Pablo. Laurent Mosti of France notched the Le Raid de Yvelines Endurance Horseride Championship for the Kingdom of Bahrain Trophy in France. The French riders dominated the 160-km event and took the top six positions. Mosti steered Baja De Piboul to win the race with a total ride time of eight hours, 29 minutes and 53 seconds. Not far behind was Remi Faucher (8:29:55) who was followed by Vincent Dupont (8:38:26) and Denis Pesce (8:38:32) in third and fourth places respectively. Joel Garcin (8:40:04) and Jean Daniel Aiello (8:44:40) were fifth and sixth. Bahrain Royal Endurance team manager Dr Khalid Ahmed Hassan presented the trophy to the winner. More than 110 riders from Europe, Qatar and Oman took part in this challenging race which was divided into six stages. Among Arab riders Qatar's Yousif Al Malki (10:21:00) was the first to cross the finish line in 23rd position overall. Oman's Mohammed Al Foori and compatriot Sami Al Balushi (10:48:37 each) shared the 28th place and Qatari Mohammed Tahous was 31st. FOUR legs triumphed over two legs, but only just, in an endurance event with a difference today. More than 300 individual runners, 65 relay teams of three runners each and 46 horses competed in the annual 22-mile Man Versus Horse race in Llanwrtyd Wells, Powys, mid Wales. Runner John Macfarlane was the first placed individual runner when he finished the gruelling course in a time of two hours, 18 minutes and 13 seconds. The time was just a mere 30 seconds slower than Geoffrey Allen from Budeleigh, Worcestershire, who crossed the line riding horse Duke’s Touch of Fun. The first race took place in 1980 and it has been a regular fixture in the eccentric village also known for its Bog Snorkelling Championships. Three years ago, Huw Lobb from Bedford became the first human to win the competition and scooped £25,000 of unclaimed prize money accumulated over the years. Equine superiority was restored the following year when horse Gifted Lady, ridden by mother-of-one Lisa Cooke, 39, from Carmarthen, South Wales, won in two hours and 19 minutes. Gordon Green of Green Events, the company responsible for putting on many of the quirky events in Llanwrtyd Wells, said: “Mr Macfarlane was very disappointed to lose by just 30 seconds. “I’m very pleased with how the day went. The weather conditions were fine and it was a glorious day. He added: “People are surprised that a runner can be as fast as a horse. You have to remember that the course is over a long distance and they have to keep horses in good condition and they have to slow down and stop ahead of the vet check halfway round the course. “All these things are slowing but are required for the welfare of the horse because it is easy to run a horse into the ground. For the first time, Oman will be among countries taking part in the finals of the ‘World Cup of Endurance’ in Malaysia in November. The historic achievement comes after riders of Royal Cavalry passed the distant phases of the French Rambuillet Race. This race qualifies contestants for the World Cup of Endurance. Sami Said Al Balushi who skilfully rode the mare ‘Luwana’ and Mohmood Marhoon Alfori, riding the mare ‘Khalifat’ passed the six race phases with unmatched success. The total distance of the phases is 160km. Well-known riders and horses of the endurance world took part in the French race. A los tres primeros lugares de cada categoría y a los mejores caballos on mejor condición física. Sábado 10 de Julio: Junta informativa, registro de jinetes, revisi´n de la ruta e inspección veterinaria. Domingo 13 de Julio: Competencia y entrega de Premios y reconocimientos. Habrá actividades dentro de la Hacienda para toda la familia. photo:TYCOON'S VISION: Members of the Mulan community repair fences in preparation for catching an Arab oil billionaire's 'super breed' horses near Lake Gregory. A HORSE-MAD oil sheik billionaire has started flying wild mares and stallions from remote WA to Dubai to create a "super breed" of endurance racehorse. Thirteen of the animals have arrived at plush stables in the United Arab Emirates from Lake Gregory, south of Halls Creek in the Kimberley. He was alerted to their plight by a website _ www.wildhorseskimberley.com _ run by Broome woman Libby Lovegrove. "The boss hasn't seen this lot yet (from Australia) because he's away, but if he likes them he will send us back for more," Mr Post told The Sunday Times from Dubai. "They are thoroughbred types with a dash of Arab with good strong hearts, something which is probably genetic and passed on from original bloodlines," Mr Post said. "We will start racing them this year and when the females are retired, we will start a breeding program." He said the sport was "massive" in Dubai because sheiks could compete. "They don't have to be expert riders or be the weights of jockeys," he said. "It's something they can do themselves and their children can do as part of something they are passionate about." "This is wonderful news that could guarantee the future of the horses and provide a form of revenue for the three Aboriginal communities around Lake Gregory," she said. "Hopefully, if the sheik is happy with them he'll take more and thus prove the value of these horses." "Today, these beautiful horses (palominos, buckskins, chestnuts and paints) roam the wild gorges, rainforests and parklands of the northern Kimberley," Ms Lovegrove said. ORKNEY SPRINGS — A few dozen riders are expected to set off at dawn this morning for what could be 24 hours in the saddle. They are part of the annual Old Dominion 100 Mile Endurance Ride, which will loop from Orkney Springs to Wardensville, W.Va., and back. Scores more will be taking part in 25- and 55-mile rides. On Friday afternoon, an open space along Happy Valley Road had been turned into a large encampment of trailers, tractors, trucks, horses, riders and veterinarians. As of Friday afternoon, 32 of the 167 riders were signed up for the 100-mile portion of the Old Dominion Endurance Ride. The remainder will take part in one of the shorter rides. For the first time in the ride's history, dating back to the mid-1970s, the race starts in Orkney Springs, on land owned by Bryce Resort, ride manager Joe Selden said. Previously, horses and riders set off from Leesburg and, more recently, Front Royal. "We outgrew the national 4-H Center in Front Royal," Selden said. "There just wasn't room for this many trailers and trucks and people and horses." One of the members of Old Dominion Endurance Rides Inc. is an Orkney Springs resident, he said. "He suggested that we look around here because the trails were so nice," Selden said. The club likes the spot of its base camp so much, it's negotiating a lease with Bryce Resort, he said. Riders have up to 24 hours to complete the 100-mile route, which has veterinary stops about every 12 miles, Selden said. "We don't want injured horses," he said. "We don't want horses getting sick because it's a lot of work." While "it's not like everybody galloping hell-bent for leather down the trail," until the final half-mile, it definitely is a race, Selden said. "It's a speed contest," he said. "The speed itself is one horse, one rider competing against the trail. The motto of the sport is 'to finish is to win.' You don't have to be the first to feel good. It's a competition against the clock and against the trail." Those riding 100 miles are setting out this morning at 5:30 a.m., followed by those going 55 miles at 7 a.m. and the 25-milers an hour later. Competitors have come from every eastern state, Selden said, and two are from Canada. Shrine Mont is providing the participants' food. Selden said the rides are open to any equine — and he does mean any — age 5 or older. "We have horses, we have mules, and one year we had a zebra," he said. Generally, about 40 percent of riders who start the 100 miles finish, Selden said. His wife, Nancy Smart, is the other ride manager. While she's not riding in this race, she's done the endurance ride in the past. "It's enormously thrilling, and you get going on such endorphins that you think you're Wonder Woman and can do anything," Smart said. "The horses are very well-conditioned to do this. It's a hard sport, and it takes an enormous amount of dedication and work on the part of the rider and the horse." Head veterinarian Dennis Seymore, from northeast Texas, has been working endurance races for 22 years. Vets will regularly check the horses for lameness and metabolic problems, Seymore said. "I think it's a great sport," he said. "You can meet people from all over the United States, lot of camaraderie." Angelique Miller and her husband, Ronald, of Jerome, are riding the 25-mile course. "I enjoy the sport," she said. "I enjoy seeing the trails. They take really good care of their horses in this sport." Mrs. Miller encouraged her husband to sign up for the ride. "She made me," he laughed. About 150 participants have confirmed participation in the Edaran Endurance Classic (EEC) 2008 at the International Endurance Park in Lembah Bidong, Terengganu on June 26. The participants for the three-day event are from Australia, France, New Zealand, Russia, Italy, Bahrain and Brazil. The tournament's organising committee chairman, Datuk Abdul Hamid Mustapha said Yang di-Pertuan Agong Tuanku Mizan Zainal Abidin would also participate in the EEC. "Tuanku Mizan will participate in the 160km ride, which is his favourite event," he told reporters here. He said the EEC would feature four individual and team events in the 160km, 120km, 80km and 40 km ride. Abdul Hamid said the main events would be the 160km ride which gave riders the opportunity to obtain their Certificate of Competitiveness (COC) for the World Endurance Championship (WEC) to be held on Nov 9, at the same place. "The organising of this year's EEC is part of the preparation for the WEC 2008 which Malaysia is hosting for the first time," he added. The WEC is held every four years. Abdul Hamid said so far, only five Malaysians, including Tuanku Mizan, were eligible to participate in the WEC. The others are Datuk Kamaruddin Ab. Ghani, Abdul Halil Alihan, Mohd Shuaib Ishak and Rosdan Mohd Nor. Jannet Van Wijk on Latino of The Netherlands race to the finish of the 2008 Dutch National Championship 160km Race moments ahead of Michaela Kosel on Black Shetan of Germany. Ms Van Wijk and Latino are the Champions of the Day, followed in completion by a trio of German riders. The beautiful weather and excellent venue provided a suitable context for this very competitive championship event! Grave concern was expressed following the Trial Run in Oviedo earlier this month when it was learnt that the Championships were due to clash with a large national cycling competition. It was reported that there would be considerable risk for competitors when sharing tracks with the cyclists. Likewise for the crew and back up vehicles. It was also reported that there was a severe lack of accommodation available during the time of the Championships. With all this in mind the FEI had submitted a request to the Organising Committee to consider a date change to avoid the clash. Whilst the FEI tries, at all costs, to avoid date changes of competitions, it was felt, under these extreme circumstances, that the risk of having the two events at the same time was too great not to have a change of date. We would ask all parties involved to kindly note this change of date and inform all persons affected. On Sunday May 25, Joyce Sousa of Hydesville and her Arabian equine partner, LV Integrity raced to a four way tie in the 100 mile Owyhee Fandango AERC, FEI,and AHA Region IV Championship in Idaho. The pair received the Best Condition award in the Arabian Horse Association Championship Ride. The pair posted a time of 9 hours and 2 minutes. The pair competed against 25 riders, most of which have been nominated for the World Endurance Championship to be held in Malaysia in November of this year. Riders came from Virginia, Utah, Arizona, Washington, Oregon, Colorado, Idaho and California. Becky Hart, World Team Endurance coach, attended the ride and divided the nominated riders into rider teams. Joyce Souza and LV Integrity teamed up with two riders from California and two from Washington. The team placed first taking the top four placings. A final training session will take place in Nevada at the end of July with the selection of a World Team sometime in August. Endurance riding is a popular sport with rides taking place across the United States. Locally, the Redwood Empire Endurance Riders put on four events each year. The first club ride will be on June 6 at the Chalk Mountian Ranch in Bridgeville. 114 Entrants from 14 Countries will test the endurance course at Rambouillet France on 7 June. The CEI*** 160km Raid Yvelines Bahrain Cup will feature members of the National Endurance Team as they qualify for the upcoming 2008 World Endurance Championship in Malaysia. The 3 day event will also host qualifiers for the upcoming 2008 World Young Horse Championship! KUALA TERENGGANU, June 2 (Bernama) -- Abdul Rahman Mohd strode his way to Terengganu's first gold medal of the 12th SUKMA (Malaysia Games) after winning the 80km endurance race in equestrian held at the Terengganu Equestrian Resort in Kuala Ibai near here Monday. The 18-year-old, riding "Tanwin Allure" averaged better speed throughout the gruelling 80km race to win ahead of team-mate Muhammad Alf Sabidi and give the host state every reason to celebrate, especially after failing to hit the gold trail on Sunday. However, despite making it a 1-2 finish in the individual event, Terengganu failed to make it a grand double when riders from the Federal Territories clinched the Team gold with better average speed from their four riders. The silver in the team event went to Melaka while Terengganu had to be contended with the bronze. A total of 30 riders from nine states - Johor, Kedah, Melaka, Pahang, Penang, Selangor, Terengganu, Kelantan and Federal Territories - started the race which lasted for about eight hours as the horses needed to be rested after every 20km. According to technical delegate for equestrian Major Yap Mou Soon, the race which started at 4pm Sunday ended at well past 1am. "The horses needed to be checked after every 20km as per the requirement stipulated in the rules of the International Equestrian Federation (FEI) and that was the reason why endurance races take a long time to complete," he told Bernama when contacted. Equestrian offers six gold medals in the SUKMA with four more coming from show jumping and dressage. Dubai: His Highness Shaikh Mohammad Bin Rashid Al Maktoum, Vice-President and Prime Minister of the UAE and Ruler of Dubai, won the endurance race in Damascus on Saturday, according to a report received here. Shaikh Mohammad and Shaikh Hamdan Bin Mohammad Bin Rashid Al Maktoum, Crown Prince of Dubai, won top honours in the 120-km endurance race. Other UAE participants came third, fourth and fifth in a field comprising 170 competitors from the UAE and Syria. Shaikh Majid Bin Mohammad Bin Rashid Al Maktoum, Chairman of the Dubai Culture and Arts Authority, also participated in the race. Maria Alverez Ponton, riding Iska, holds first place at the 2008 Compienge CEIO 160km race. Ms. Alvereze Ponton held a spead of 25.055 km/hr on the final 6th phase of the race to hold the lead ahead of Laurent Mosti (FRA) on Khandela des Vialette (2nd) and Karin Boulanger (BEL) on Armia.